The Tempest, along with A Midsummer Night’s Dream, seems to me to be among the most magical of Will’s comedies, with illusion, love, conflict and happy endings all genially conspiring to entertain us. Generally assumed to be the last play Shakespeare composed for the stage, completed in 1611, it’s ironically also the first play contained in the posthumously published First Folio of 1623. Meanwhile, D G James’ The Dream of Prospero is an expanded version of the author’s Lord Northcliffe Lectures of 1965 in which he sought to extend his reflections on Shakespeare’s great tragedies to musings on the last plays and, specifically, The Tempest. Bacon’s description of poetry as “a dream of learning” had provided the title to an earlier published discourse, and James followed this conceit here, appropriately given Prospero’s celebrated speech from Act IV. 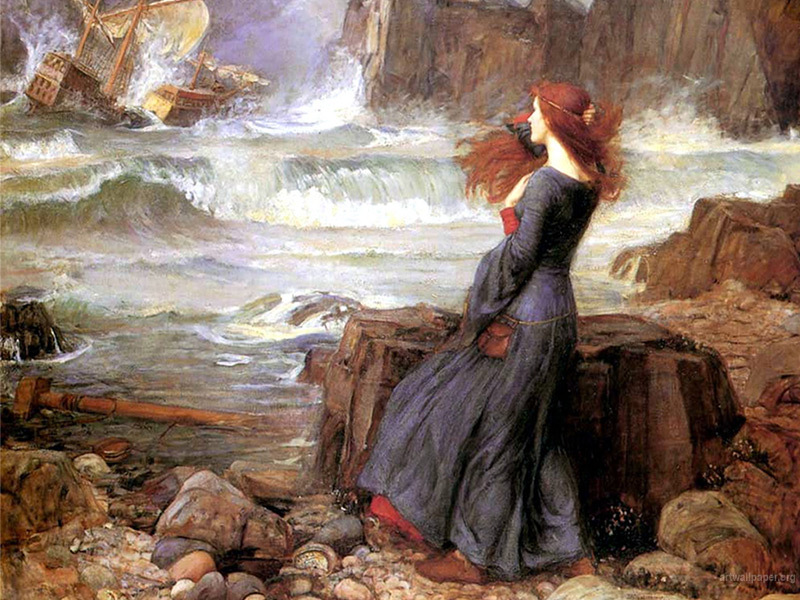 But how much of The Tempest is a dream-like fantasy, how much based on real life? The Dream of Prospero commences, confusingly, with a lecture entitled “The End of Tragedy”, a discussion on Hamlet and King Lear which picks up on themes James treats in The Dream of Learning (1950). For him Hamlet — somewhat like a novel — “exhibits sentiments and events, not characters and deeds”; adapting the Prince’s own words he declares that “the name of action is removed, the pale cast of thought holds the attention”. But while in Hamlet evil is “an obsessive vision,” in Lear it is a visible power. When we come to the second lecture, “The Storm” — this time focusing on the play in hand — the apparent tragedy of the shipwreck, with innocent souls lost, turns out not to be a tragedy at all. There are in fact three dream-like versions of this disastrous tempest, Miranda’s vision (where all perish); her father Prospero’s version where seemingly only evil-doers are saved (“bountiful Fortune … hath mine enemies / Brought to this shore”); and a third scenario, where some of the guiltless are also saved, namely Gonzalo and Ferdinand. The constantly shifting sands of truth make us doubt what we see, in contrast to the gradual unfolding of the plots in the tragedies with the threat and reality of violence ever present. Before he was deposed Prospero was the legitimate Duke of Milan, but gave over much of his time to the study of the Liberal Arts. And yet he is generally regarded by present-day audiences as a kind of magician, with power over nature, illusions and the spirit Ariel. But we also know that Black Magic was anathema to the Church and State, held in fear and contempt as Marlowe’s Doctor Faustus made all too clear. So how did Shakespeare get away with his mostly sympathetic treatment of Prospero at a time when James I, the author of Daemonologie (1599) which inveighed against witchcraft, was only lately King of England as well as of Scotland? The fact is, as D G James tells us in “The Magician”, that the Daemonologie distinguished on the one hand between magicians using talismanic signs and images while practising astrological magic and, on the other, witches who trafficked with daemons. Theoretically theology might allow commerce with angels but the dividing line between heavenly messengers and daemons was rather hazy, and practitioners ran the risk of their angelic correspondents being seen by the authorities as devils in disguise. Shakespeare sidestepped this by having Ariel performing the magic under Prospero’s commands; as Ariel as has the -el termination that denotes an angel in Hebrew tradition (as Michael, Raphael, Gabriel and Uriel testify) Prospero and his author conveniently avoid the taint of forbidden magic. This 1584 report by Arthur Barlowe gives an optimistic account of the colonists’ reception by the locals, but only a year later the Elder Hakluyt was taking a harder line with possible opposition: “If we finde the country populous, and desirous to expel us … that seeke but just and lawfull trafficke … we are the better able … to annoy them.” Here is an exact parallel with Prospero’s colonisation of Caliban’s island, with the imposition of external control by reason of a Christian God’s laws a dubious justification for Might as Right. The second Virginia Charter of 1609 also mentioned two key elements that contributed towards the several disasters that the Jamestown, Virginia colonists suffered between 1606 and 1609: “first, the Tempest” that split apart the fleet and wrecked the Sea Adventure on “The Devils Ilands” of Bermuda; “next the absence of the Governor” who, surviving the Bermuda wreck, was nevertheless separated from the rest of the new colonists who had finally reached Jamestown. Tempest and Governor (in the person of Prospero) naturally both figure in the play. James further argues that Shakespeare was acquainted with individuals such as William Strachey, who had both travelled and reported on the expedition, and who had returned to England in the year of the likely first performance of The Tempest, perhaps giving the playwright a personal account. James also draws some more tenuous parallels between Thomas Hariot’s description of native beliefs in A Briefe and True Report of the New Found Land of Virginia, first published in 1588, and Caliban’s philosophy. I shall only briefly mention James’ last two lectures, both wide ranging and thought-provoking but with complex arguments. “The Dream” touches on the unreality of the Island, even suggesting that we are left with the impression “that Prospero in truth never left Milan, and that the island and all that we see happen on it was a dream of Prospero’s only”. “The Mystery” draws attention to the masque which both seems an addition and yet integral to the play. Prospero is both a kind of “Providence ordering all things” but also the Duke of Milan “reclaiming his own”. Finally, James follows the convention that in The Tempest Prospero is likely Shakespeare himself, author, actor and creator of illusions. Whether true or not — and we may choose to believe it in the absence of any evidence — there is a poetic rightness to this notion that provides an emotional satisfaction. These expanded lectures, while provided with footnotes and references, weren’t designed to be a exacting study or survey of the play (there is no index, for example); what they do however is focus on key issues that the author found fascinating, such as the historical context and the relationship between reality and fantasy; and, half a century on, although scholarship has moved on, there is still much of value to be gained from the insights these his lectures provide. They certainly help prepare not only for a rereading of the play itself but also for exploring creative re-workings, such as Marina Warner’s novel Indigo. I like it when writers writing about writings follow aspects that interest them rather than trying to give THE definitive analysis.